New Asheville customer needed to upgrade his water filtration system which consisted of a water softener and an Iron filter. The system was quite old and outdated in technology. The water had an unpleasant odor and felt hard. 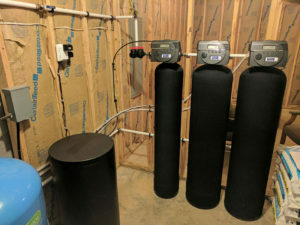 He wanted the best that’s in the water filtration business, and he chose Mountain Water Systems Platinum Series after reading our reviews on the website. This water filtration is top of the line and American-made. Also, by upgrading to the newest and best, they will save money in operating costs and salt consumption. This filtration system is very efficient. We have also plumbed for another Platinum unit to go in very soon! Almost immediately they saw a huge difference in the quality of the water and also the efficiency at the level the equipment was running. The customer was happy about the set it and forget it we set up. The softener removes the hard water that protects your pipes and appliances. The iron filter removes the brown staining and metallic smell. 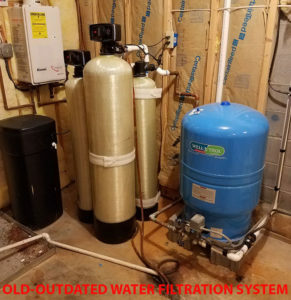 As you can see in the picture, there is a big difference between the old and new filtration. The new Platinum equipment has new tanks and updated valves including battery back-up.